A Waiters' Race, or "course de serveuses et GARÇONS de CAFÉ", is a race that tests the speed at which a waiter can carry a loaded tray without tipping any of its contents. 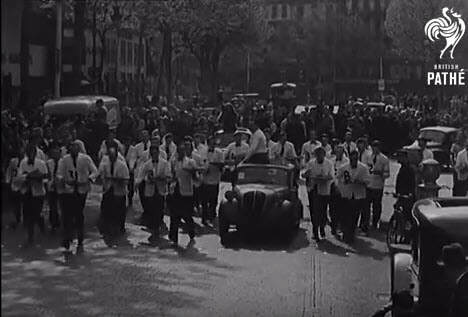 This race has been going on in France since the 1930's. 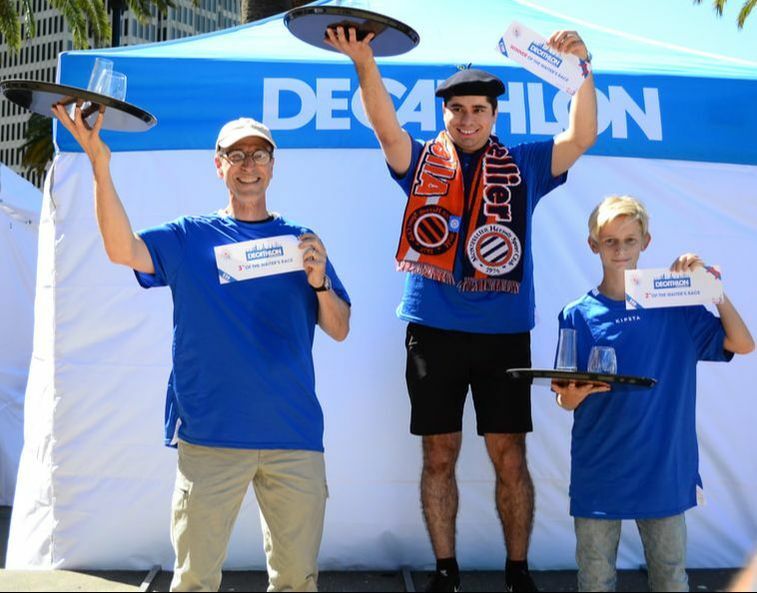 The first of its kind in San Francisco and sponsored by decathlon, the race will start at 3.30 pm. if you are interested in competing, please register ONLINE HERE. THE EVENT IS A FUN COMMUNITY EVENT BUT WITH A COMPETITIVE EDGE. AS SUCH COMPETITORS AGREE TO FOLLOW THE RULES AND CODE OF CONDUCT. THE WAITERS’ RACE WILL TAKE PLACE RAIN OR SHINE. COMPETITORS MUST BE OVER THE AGE OF 18 YEARS FEMALE or MALE. APPROPRIATE STABLE FOOTWEAR FOR OUTDOORS AND THE WEATHER CONDITIONS ON THE DAY MUST BE WORN. ALL JUDGES DECISIONS ARE FINAL AND NO CORRESPONDENCE WILL BE ENTERED INTO. THE WINNER AGREES TO HAVE THEIR PHOTO USED FOR PUBLICITY PURPOSES BY OFFICIAL COMMITTEE AND THE BASTILLE DAY AT SAN FRANCISCO SPONSORS. ANY DISPLAY OF PROMOTIONAL MATERIAL/PRODUCT FROM ANY SUPPLIER FEATURED AT THE WAITERS’ RACE DOES NOT CONSTITUTE AN ENDORSEMENT OF THE SUPPLIER OR PRODUCT/S BY OFFICIAL COMMITTEE. THE RACE ORGANIzERS WILL TAKE EVERY STEP TO ENSURE THAT EACH ACTIVITY IS AS SAFE AS POSSIBLE FOR RACING. CONTESTANTS MUST TAKE ALL MEASURES TO ENSURE THEY RACE IN A SAFE MANNER. THE ORGANIzERS WILL NOT BE HELD RESPONSIBLE FOR ANY INJURIES CAUSED BY RECKLESS BEHAVIOR.